Southern-accented comfort food, including killer fried chicken, in the East Village. 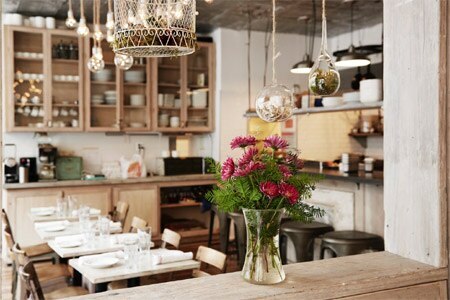 : You won't miss Root & Bone walking by on the street as you'll likely have to navigate around the hoards waiting for a table at this perennially packed spot by Top Chef alums Jeff McInnis and Janine Booth. An approachable wine list, with a stable of American and Aussie labels, isn't super sophisticated but the selections pair far better with the food than the cocktails, which skew syrupy sweet. The hardest part of ordering is deciding how much fried chicken you want. You could start with the chicken biscuit as a snack, and then move on to the fried chicken and cheddar waffle appetizer, and proceed to a whole or half fried bird in a bucket. Either way, we recommend the sweet tea-brined fowl. Biscuits, served with a savory jus, are familiar yet also new. Meanwhile, caprese salad is freshened up with grilled peaches. Sticking to the Southern theme, the banana cream pie is the finale you should order, if you don't decide to go for another piece of chicken for dessert.